In this tutorial we will create a pond bridge using the Extrusion, Box, and Convert to Custom Model tools. While at first glance the bridge may appear to be complicated, you will soon discover that it's actually quite easy using the new modeling tools included with our 3D landscape design software. 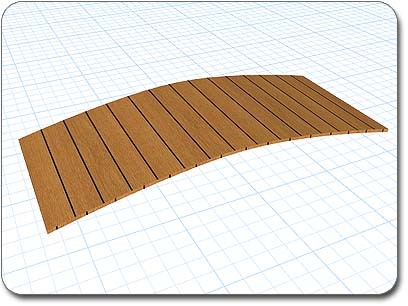 To get started, we will create the bridge surface using the Extrusion tool. Once the surface is created, we will rotate it into place, give it a material, and then move on to building the supporting structure. First, click the Extrusion button that appears when the Modeling tab is selected. Draw a shape as shown in the picture below. The shape is basically a skinny bent rectangle. We recommend that you draw the shape somewhat roughly at first, complete the shape, and then click the Edit Points button and refine it. While drawing fine detail like this extrusion, we recommend that you turn off the snapping. Tip: In a later step we will be creating some other shapes similar to this one, so we recommend that you save the shape of your extrusion now for use as a starting point. To do this, click the options button next to the Edit Points button and click Save Shape. Set the Height of the extrusion to four and a half feet (4’6”), and convert the extrusion to a custom model by clicking the Convert to Custom Model button that appears when the Modeling tab is selected. 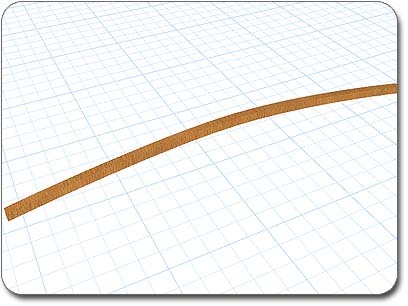 Once the extrusion is converted to a custom model, set the Rotate about X property to ninety degrees (90), and set the Elevation property to approximately negative one foot and two inches (-1’2”). 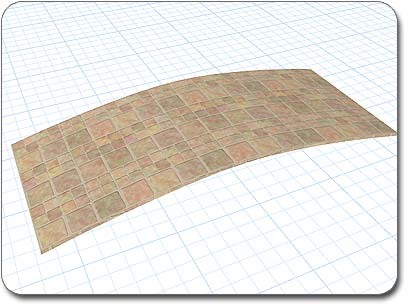 With the model still selected, click the picture of the default material to the right corner of the screen. When the library appears, click the Deck and Fence Boards category, and click Wood111_boards. As you can see in the above picture, the bridge surface is coming along nicely but the sides of the model look a bit off. 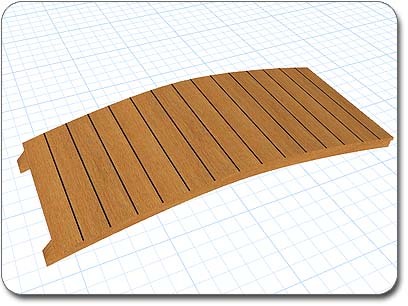 The problem is that our board material has lines indicating the separation of the boards, which is great for the top of the model but not for the sides. 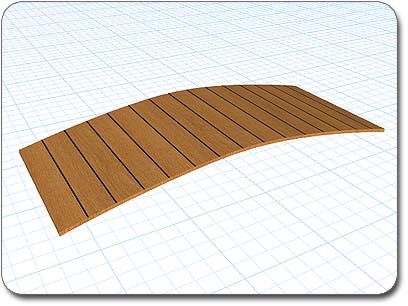 To correct this, click Edit Polygons, select all of the side polygons, click the material picture to access the library, click the Deck and Fence category, and click the material Wood111. Next, we'll create the curved supports that are located under the bridge surface and give it stability. To create these we will again be using the Extrusion tool. We will start by creating one support, and then we will duplicate it and place both supports where they belong under the bridge surface. Click the Extrusion button that appears when the Modeling tab is selected. Draw a shape as shown in the picture below. Tip: If you saved your shape in Step 1, then you should load it now for use as a starting point. To load your shape, click the options button next to the Edit Points button and click Load Shape. Set the extrusion Height to four inches (4”), and convert the extrusion to a custom model by clicking the Convert to Custom Model button. 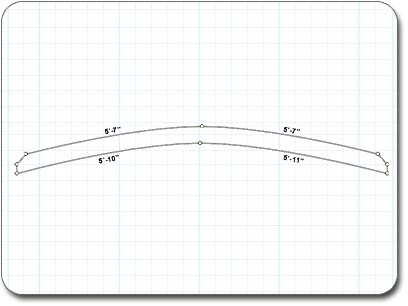 Once the extrusion is converted to a custom model, set the Rotate about X property to ninety degrees (90), and set the Elevation to about seven inches (7”). Then set the material to Wood111 as you did before. Tip: If you want to adjust the size and direction of the wood grain, click Set Mapping and then set the Width, Height, and Angle properties as desired. Copy and paste the support, and place both supports under the bridge surface as shown below. The posts of a pond bridge are important not only for supporting the handrails, but also because they increase the bridge's aesthetic appeal. We will be creating a post through the use of four boxes, and then will copy and paste the completed post before moving it into position. Create a box by clicking the Box button. Click on one part of the landscape to place on corner of the box, and click again on a different part of the landscape to place the other corner. Next, set the Length and Width of the box to six inches (6”) and set the Height to two and a half feet (2’6”). Then set the material to Wood111. Copy and Paste the box. On the copy, set the Length and Width to eight inches (8”) and set the Height to one inch (1”). Once the box is resized, place it on top of the first box by setting the Elevation to two and a half feet (2’6”). Copy and Paste the first box again. On the copy, set the Length and Width to four inches (4”) and set the Height to two inches (2”). Once the box is resized, place it on top of the second box by setting the Elevation to two feet and seven inches (2’7”). 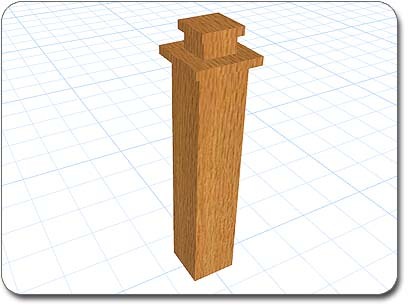 The final step to creating our model is to add a handrail on each side between the two posts. 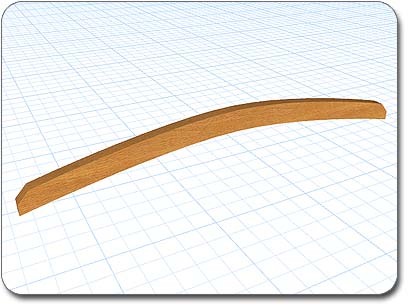 To create the handrails, we will again make use of the Extrusion tool. Once one handrail is finished, we will copy and paste it on the other side. Click the Extrusion button. Draw a shape as shown in the picture below. Tip: If you saved your shape in Step 1, then you should load it now to use as a starting point for the extrusion in this step. To load your shape, click the options button next to the Edit Points button and click Load Shape. Set the Height of the extrusion to two inches (2”) and convert it to a custom model by clicking the Convert to Custom Model button. Then set the material to Wood111. Next, set the Rotate about X property to ninety degrees (90), and set the Elevation to two feet and four inches (2’4”). 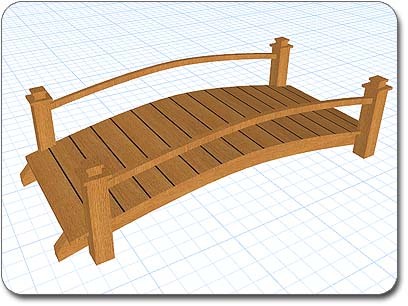 Copy and Paste the railing, and move the railing onto the bridge as shown in the picture below. Finally, we can add the bridge as a permanent addition to our library. 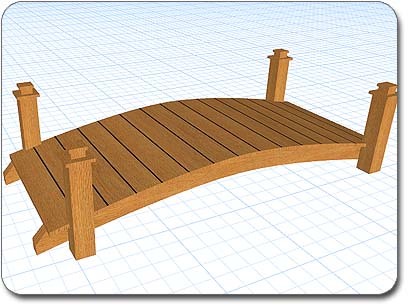 To do this, select the bridge and click Tools > Model Creation Wizard. Follow the prompts of the wizard, and select Accessory when asked what kind of model you are creating. Once the wizard is complete you will have completed this tutorial. Congratulations! 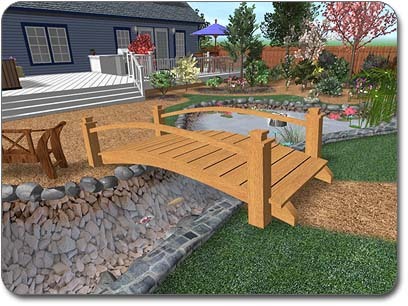 You have now created a custom 3D pond bridge which you can easily add to your future landscape designs.